Once reserved for the wealthy and the social elite, portraiture has been democratized down to the informal level of the selfie. Freed from its staid origins, the modern portrait can be heroic representation, transgressive, humorous or an act of wish fulfillment. 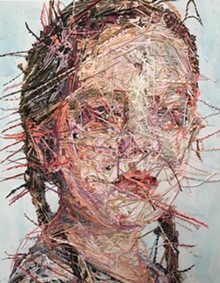 Current Profile, the new exhibition at the Craft Alliance Center of Art + Design (6640 Delmar Boulevard, University City; www.craftalliance.org), explores contemporary portraiture in all media. The show features everything from Richard Wehrs' sculpted bust of an alien warrior to Cayce Zavaglia's embroidered image of a young woman in pigtails, and all points in between. Current Profile opens with a free reception from 6 to 8 p.m. Friday, January 11. The exhibition remains up through March 17.